Crafting Adventures: A Charismatic Whimsy Fairy....! 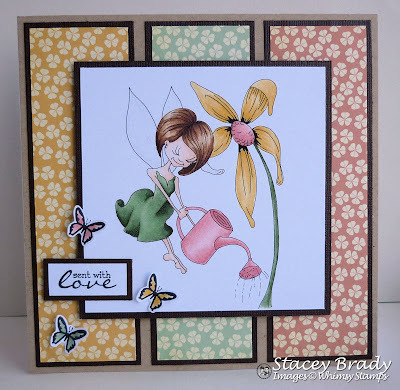 When I saw that the challenge over at Charisma Cardz was to make a card using fairies, I just knew I had to pull out one of my latest Whimsy stamps! And then, I spotted that Crafty Angels want you to use butterflies somewhere on your creation.... yet more Whimsy goodness to play with! Image Stamp: Water Lily by Whimsy Stamps. Sentiment: Oval Snippets by Whimsy Stamps. Paper: Earth Love by Cosmo Cricket. Copic Colours: E00, E11, E29, E31, E33, E35, E37, E50, R20, R22, Y17, Y21, G21, G85, G99. Tools & Embellishments: Butterflies part of Whimsy sentiment set. Whilst we are on the subject of the wonderful Whimsy, I have a few bits of info to share with you. Firstly, Denise is running a fab sale on some of the stamps at the mo, you really need to check out the specials section! Even more exciting, there is currently a guest designer call running for April/May. So if you love Whimsy, head over to the blog right now for further details. I love that image!!! Super cute card!!! This is adorable Stacey, the image is the sweetest ever! This is beautiful Stacey, your image is gorgeous and I love the three coloured panels behind it. Very sweet card, love the layout too. Super cute Stacey!! Love the little butterflies too! WOW - stunning card! I love the colours and the lovely image. How adorable, Simonne! Wow, LOVE how you put those panels together - great choice! !